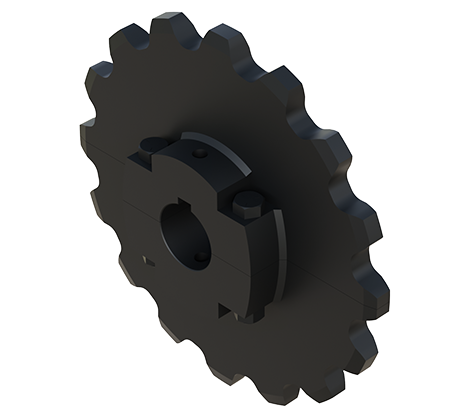 Black Ace Engineering Class Sprockets are manufactured with the highest integrity. You will find value, as these sprockets are flame-cut and machined with the highest precision available on the market. ASME Standard Torch Profiles – Elongated Root Design promotes a self-cleaning effect of the root to keep your demanding applications moving. B Type (hub on one side) used in applications where clearance width is narrow. More economical than C Type. C Type (hub on both sides) used in applications where B Type is not wide enough to withstand torques produced by drive. Split Style Construction – Once you use a Split Sprocket, you may never want to use a setscrew mount style again. Removal or installation is a breeze. Can be used in virtually all applications. An additional benefit to Black Ace’s split sprockets is that the shaft/keyway security is much tighter than a typical setscrew mount. Hardening Available – Flame hardening of sprockets is available as an option. 13/16" 7/8" 1-5/8" 1-1/4" 1-7/32" 1-3/4" 1-1/2"
3/4" 7/8" 1-1/4" 1-1/4" 1-1/8" 1-1/4" 1-1/2"